On January 4, we teamed with the Bullock Texas State History Museum for its Free First Sundays event. The focus of that day’s exhibit and activities were on the La Belle shipwreck and associated archeology. We were joined by Texas Archeological Stewardship Network members May and Jim Schmidt for fun, hands-on demonstrations that showed children and parents how to make replicas of a 17th century cloth Singleton button in less than five minutes. Why were buttons chosen for the demonstrations? The wreckage of La Belle included approximately 329 wooden and 24 pewter buttons. Several of the recovered wooden buttons still retained the original thread coverings that were made by wrapping the thread around a wooden blank through a central hole. Pewter buttons were inexpensive in the late 1600s, and the ones found on La Belle may have been uniform buttons. Very different than either the pewter or wooden buttons from La Belle, small glass rings found on La Belle and at Fort St. Louis have been suggested to have served as the base of a button similar in construction to the English Singleton. Originally made in the English county of Dorset, the Singleton button was popular from 1622 until 1850—a time period that included the late-17th-century voyage of La Belle. It used a small disk or ring as its base, which is covered in fabric, stuffed with padding, and then embroidered. The name “Singleton” comes from the Singleton family who made a specialty button of this style in the 1600s. By sharing the process of button making, participants were able to glimpse into the 17th century to see how clothing was made and how important buttons were as fasteners for all types of garments. Before the mid-1800s, buttons were among the most effective means of fastening clothing. Elastic was invented in 1820, but wasn’t used as we know it today until 1900. The safety pin, with a spring and a clasp catch, were patented in America in 1849 by Walter Hunt. Although the hook and eye closure first appeared in the 1300s in England, it was the addition of the “Delong hump”—patented in 1889 by the Richardson and Delong Hook and Eye Company—that created a hump in the hook that prevented the eye from slipping out. Patented in 1851 and marketed in 1892, zippers were used in leather jackets by 1925 and then in flys of pants around 1937. In addition to a fun history lesson, the demonstrations allowed participants to appreciate how labor intensive the manufacturing process of hand-sewn clothing was. The Bullock Museum hosted several other La Belle-related interactive activities, including writing with quill pens, threading trade beads, living history reenactments, and conversation carts in the exhibits. 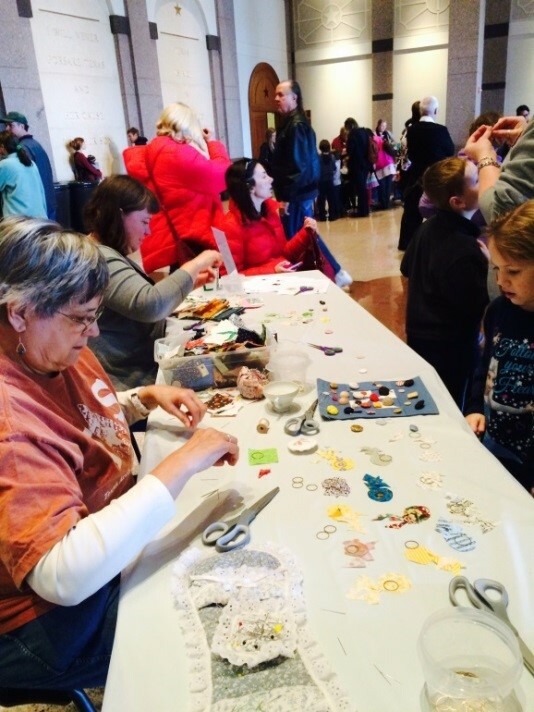 More than 2,000 people attended the Free First Sunday event, and about 800 visited the family activities, which included our button demonstrations. We estimate that the participants made more than 300 buttons, which they were able to take home with them. In addition to the button demonstrations, Jim Schmidt provided How to Get Involved in Texas Archeology and What Does an Archeologist Do brochures, instructions for making Singleton buttons at home, and information on volunteer opportunities with avocational archeological societies. 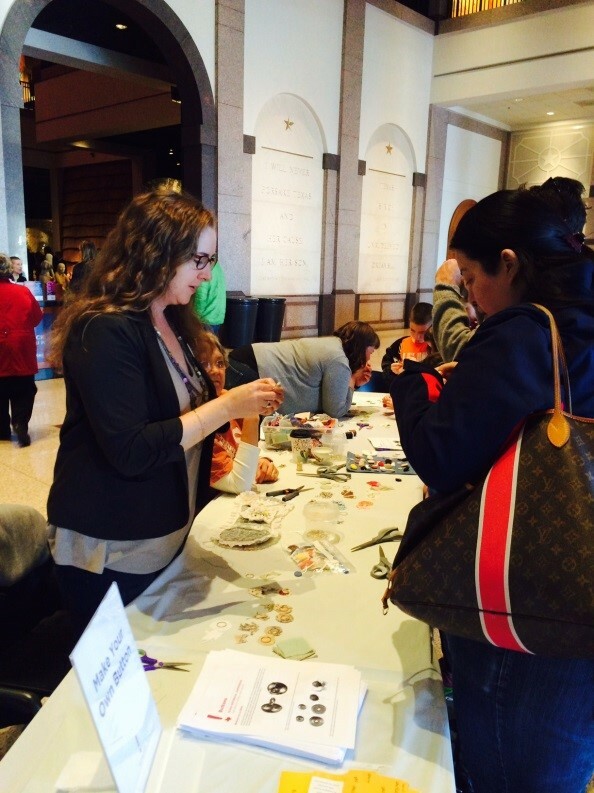 Overall, it was a great outreach opportunity with the Bullock Museum, and we look forward to making more buttons! May Schmidt (foreground) and Lisa Worley (seated to May’s left) at the button demonstration table.